An English Homestead: Scotch Bridget Apple Still Good To Eat On The 10th Of June! Scotch Bridget Apple Still Good To Eat On The 10th Of June! I've just been cleaning out my fruit store and found a apple that's still good to eat on the 10th of June! In fact it tastes amazing and has only been stored in a frost free shed with no real special care except plenty of air flow. Scotch Bridget is a duel purpose apple and one I've planted everywhere I've lived, a great apple to have growing if you're aiming for self sufficiency or living a preparedness lifestyle or even just wanting to cut your food bill and know where your food is coming from. The ability to store fruit like this would have been key to survival in the past and finding the right varieties combined with using storage methods of the past is an important skill to practice. I've written about it before on this blog here and here. What's the longest you've kept apples for? 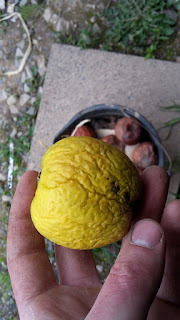 We find that Blenheim Orange (another dual purpose Apple) keeps a long time, although even if they were good for June we would have eaten them all by then. I've normally eaten all of mine by now as well but these were left to see how long they'd go. I have a Blenham orange tree as a cordon against my veg garden, very nice apple. That's amazing. Our apple storage consists of canning and cider making. I'll have to look up that apple. We have an old orchard here that i'm thinking is original to the house (1930's) at least. Hoping you might be able to help me ID one of them when they start coming in - it's pale yellow and has pink stripes like a pepeppermint? Can't find anyone who knows what it is. Oh I look forward to seeing them - I'll try my best to find out what it is. If I don't know then I might know someone who does. None of mine is a good keeper, but France is not a good Apple country. Of all of ours the one that keeps the longest is the Bramley, and we're lucky if they make it to Christmas. These outstay Bramley by a long time. I have a few french varieties here, they seemed very good at breeding them in the past. are you selling this tree in your etsy shop? I was but I'm only doing them bare root so it'll be November time before I sell any more.